Photos courtesy of Al McPhee. 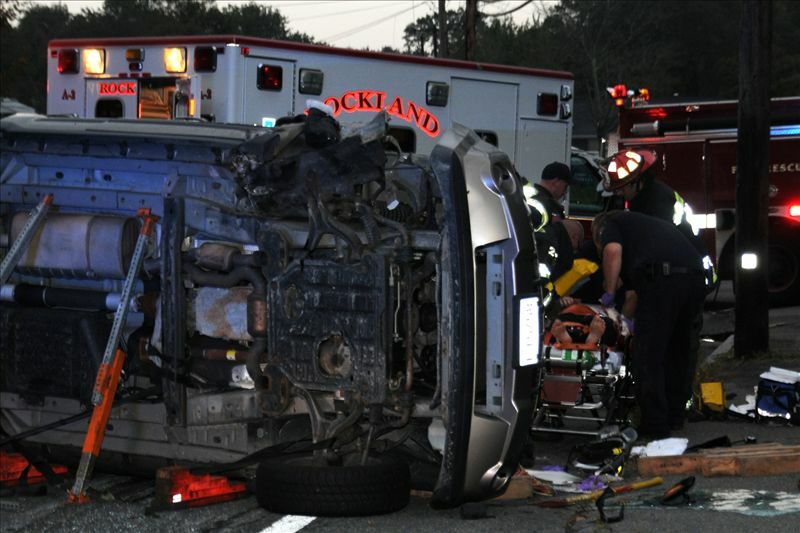 ROCKLAND — Rescue workers in Rockland had to cut an SUV apart and use airbags to free a woman who was trapped for about 30 minutes. The SUV hit a curb and then grazed a utility pole and tipped over onto the driver’s side at about 6:10 p.m. Thursday at Market and Old Market streets, firefighters said. They said the woman was partially trapped underneath the vehicle. Rockland and Hanover firefighters used airbags to lift the SUV off of her and then cut through the roof of the vehicle. The woman was taken by ambulance to Boston Medical Center. The woman’s name and condition had not been released as of this morning. Firefighters said they had requested a helicopter but that it was grounded because of the weather. Firefighters said it took about 30 minutes to remove the woman, who was alone in the vehicle. Stephanie Spyropoulos contributed to this report.